Airport farewell: Cairns Catholic Education’s four representatives making their final good-byes at the gate. 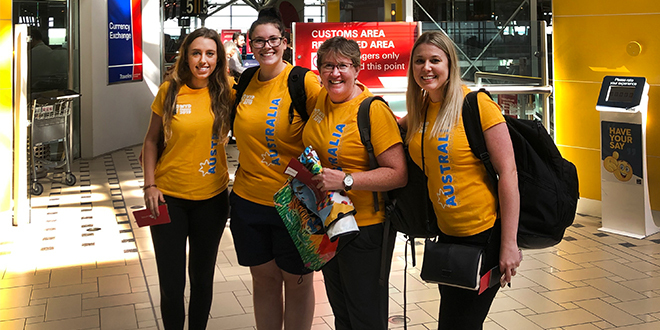 FOUR Cairns Catholic Education women have trekked their way to Panama to celebrate World Youth Day 2019. Catholic primary school teachers Jenai Stone, Natalie Jensen and Kara Martin set off with CCE identity and outreach director Sharon O’Keeffe to engage and explore their faith. Ms O’Keeffe said in a reflection that it had been a blessed journey so far. “While all have said ‘yes’ to this pilgrimage for different reasons, each has come with their whole self and a thirst to come to know God more fully,” she said. “For me, the opportunity to engage with young adults and delve deeper into what they desire in the sphere of faith formation has been both insightful and energising. Ms O’Keeffe was a veteran of World Youth Days, having been to the past four. She said the highlights were easy to name – being in the presence and learning from Pope Francis and numerous cardinals, bishops, priests and other religious men and women. “The challenges of this spiritual journey are often the unspoken elements, immense crowds, long unpredictable days not to mention the emotional rollercoaster that rich conversation with God can offer,” she said. She also discussed the challenge and the unpopularity of Catholicism in 2019 following the international abuse scandal. She said we needed to remind ourselves that Jesus was not so popular either. “To be frank, expressing my Catholic Identity is not related to popularity at all,” she said. After visiting the Embera people – the Indigenous peoples of Panama and Colombia – Ms Jensen said people took so much for granted in Australia. “Visiting the Embera people was an amazing experience,” she said. “From the moment that we got there, welcomed by the local people’s singing and dancing, it felt warm and inviting. “Before you even arrive, you can see that it is a contrast to how we live in Australia. Shown into the school, Ms Jensen was surprised to see no walls, fans, interactive whiteboards or computers. “But yet – they are happy with what little they do have,” she said. Ms Stone said embarking on WYD gave her the opportunity to visit “incredible places” and meet “amazing pilgrims”. “I feel as though I am already beginning to see things in a different perspective by truly just being, taking in the surroundings and listening to nature,” she said. “I have never been a person to truly stop and reflect whilst keeping an empty and open mind. She said she was excited for what else was to come on the pilgrimage and looked forward to returning to Cairns to share her experiences.